“In all cases, the announcement of a state of emergency will be for a limited time period not exceeding 6 months,” so says article 59 of the provisional constitution. ‘In all cases’, that’s a very powerful phrase and it’s not a mistranslation either. It did not say in ‘all of the above cases’ or ‘in most cases’ or ‘in all relevant cases’. The absoluteness of this statement is beyond contention. Since this is the constitution we’re plagued with, we must follow this rule. According to Tarek El Bishry, who headed the committee to write the new constitutional declaration, the emergency law has ended on 19 September, 6 months after the referendum. I personally think it will end on 30 September, 6 months after the adoption of the provisional constitution on 30 March . In any case, we know that we were in a state of emergency when the SCAF announced that military trials will be ongoing as long as the emergency law is active. That happened even before the events of the Israeli embassy on 9 September and the announcement that the emergency law was necessary. The SCAF on the other hand, thinks that Mubarak’s declaration of the extension of the emergency law is still valid till June 2012. They are gravely mistaken. Article 62 states "All laws and regulations decided upon before the publication of this Announcement remain valid and implemented; however, it is possible to cancel laws or amend them according to the rules and procedures adopted in this Announcement." 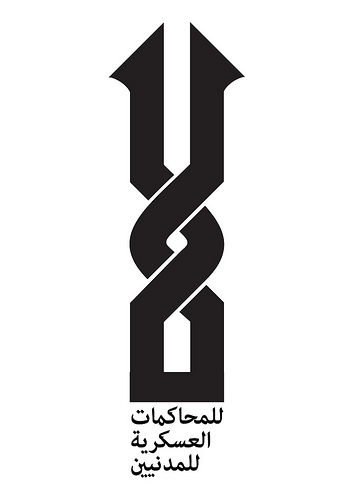 This means that any law in conflict with the new constitutional declaration needs to be amended to match the constitution, which means the decision taken in 2010 to extend the emergency law is void because it is in direct conflict with the constitution and constitutions supersede any law. 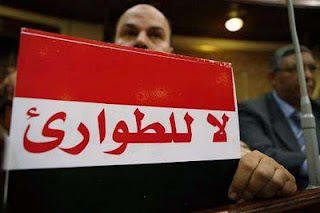 The SCAF do not have the power to extend the emergency law in absence of a parliament and a popular referendum. The president of the republic, after taking into account the opinion of the cabinet, can announce a state of emergency as stipulated in law. He/she must present this announcement to the People’s Assembly within the seven subsequent days to decide its view on this matter. If the state of emergency is announced in a period of recess, the Assembly must be called back to session immediately to review the matter, taking into account the time limit mentioned above. If the People’s Assembly is dissolved, the matter will be reviewed by the new Assembly at its first meeting. A majority of the members of the People’s Assembly must agree to the announcement of a state of emergency. In all cases, the announcement of a state of emergency will be for a limited time period not exceeding 6 months. It is not permissible to extend it, except after a people’s referendum on the matter and their agreement to an extension. In all cases, we cannot be in a state of emergency for more than six months. Yet we are. The real state of emergency is a military dictatorship that does not respect the constitution or the law or any of its citizens for that matter. The real problem is that we have no means of respecting the law as long as the enforcers themselves are the law breakers. I know I’m revisiting an old topic, but perhaps it is not clear to some that the referendum has been disrespected and the constitution has no legitimacy. What was the referendum about? The answer is not as complex as some people make it out to be. It was a referendum to change eight articles of the 1971 constitution. Argue what you will about what you thought it was, that is what was written and that is what you signed. It wasn’t about Article 2 of the constitution as some made it out to be and it wasn’t about the legitimacy of the Supreme Council of Armed Forces (SCAF) as others claim. It was all written in the document signed by millions of Egyptians. It makes no sense to argue that the referendum was something other than was written. Why would it be? Why would they not write what it truly was? If you signed a cheque for a million pounds, is it a valid argument to claim that you were told it meant a hundred pounds? It would only make sense if you hadn’t read what you signed, and that would be foolish anyway. The reason we have to be crystal clear about what the referendum was about is to understand whether it was respected or not. The truth, plain and simple: It was not. Had the referendum been respected, the ’71 constitution would have been brought back to life with the eight articles amended and any contradiction removed. This meant, however, that the head of the constitutional court would take charge of Egypt, something the SCAF would never allow. Assuming for a ludicrous moment that respecting the referendum meant a new constitutional declaration that nullifies the ’71 constitution, what would it entail? It would mean adding articles from ’71 constitution along with the eight new articles voted in. Even though this scenario would have contradicted the text in the referendum, it still would have been acceptable. What actually happened is nothing short of a disaster. The SCAF added seven of the eight articles voted in by Egyptians, altered one of them and declared a new constitution. They added a grand total of 57 more articles that no one agreed to or was aware of. Although many articles were compliant with the dreaded ’71 constitution, the number of crucial and dictatorial articles added was almost as many as those voted on. 4) Calling the People’s Assembly and the Shura Council to enter into normal session, adjourn, or hold an extraordinary session, and adjourn said session. 5) The right to promulgate laws or object to them. 6) Represent the state domestically and abroad, sign international treaties and agreements, and be considered a part of the legal system of the state. 7) Appoint the head of the cabinet and his/her deputies and ministers and their deputies, as well as relieve them of their duties. 8) Appoint civilian and military employees and political representatives, as well as dismiss them according to the law; accredit foreign political representatives. 9) Pardon or reduce punishment, though blanket amnesty is granted only by law. 10) Other authorities and responsibilities as determined by the president of the republic pursuant to laws and regulations. The Council shall have the power to delegate its head or one of its members to take on its responsibilities. I am quite certain that if a law suit were to be filed against the SCAF for their actions in disrespecting the referendum, the court would rule against them. However, as things stand, the SCAF control everything and so fairness is not an option. Other articles that were not part of the referendum or the 1971 constitution are 57, 58, 59, 61, 62. Article 189 was transformed into article 60 with changes contrary to the referendum which accepted the article as it was. The intentional disrespect of a nationwide referendum is symptomatic of a dictatorship that did not end with the fall of Mubarak. If a person’s vote has not been respected in a referendum that the SCAF itself designed, then how will it be respected in the upcoming elections? Those calling for a constitution before elections are not disrespecting the referendum in any way. It is the SCAF that disrespected the referendum, the revolution and the entire country. These are greedy men who will never relinquish control. The storming of the Israeli embassy is a catastrophe, not because it is a diplomatic incident, or because protests got out of hand, but because there was no storming of the embassy. The real catastrophe is in the fabrication of an event by the armed forces in order to create their own version of Pearl Harbor, or 9/11. The reason for this is only so that the SCAF can tighten its slipping grip over Egypt’s politics. The plan is to bring back the practices of arbitrary arrests and subjugation without an onslaught from the media or public opinion. This time, the laws target the revolutionary youth instead of the Muslim Brotherhood. The inaccurate presentation of the embassy events as an attack that could lead to an international crisis helps instill fear in the heart of Egyptians who do not want chaos in their country. One of the least talked about issues when it comes to the events of September 9 is how the so-called storming of the embassy flat happened. The media portrays it as some uncontrollable attack by a mob where security forces lost control. The truth couldn’t be farther. The tearing down of the wall, was a celebration that met no resistance from the myriad of security personnel present there. The protesters did not greatly outnumber the number of soldiers with perhaps over 40 trucks in the vicinity of the embassy. This means that the most conservative estimate places 2000 soldiers charged with the protection of embassies in that area. After the demolition came celebrations. The next part of the show was allowing Ahmed El Shahat wannabes to scale the building to take down the Israeli flag. Not just one person, but 4 of them attempted to scale the building, the most successful of which managed to make it to the fifth floor. At this point they were all summoned in, possibly with assurances from the army that they will not be arrested and will be allowed to continue. This all took place in the Israeli embassy building mind you, not the one next to it which Ahmed El Shahat scaled. It is important to point out that all those who made it through were almost handpicked, and the army did not allow anyone to go through. What followed was incomprehensible. They remained for inside the building for about 20-30 minutes inside the building before re-emerging once more on balconies on various floors. The climbers waved from the balconies and crowd cheered in euphoria from below. It was very odd to see that amount of people let inside the building despite heavy security presence below. Every once in a while, it seemed that yet another floor and another apartment was invaded. Around 15 of them ended up on the roof of the next door building and around 10 of the others were seen 2 floors beneath the Israeli flag in yet another balcony. One has to wonder how all these apartments were invaded and why. Below, no more protesters were allowed in. On another front, clashes broke out between CSF and protesters. That was near the Saudi embassy, and possibly another way of accessing the Israeli embassy building. Rock throwing and fending off attacks, that was the deal at the back, but not at the main entrance, not where the show was at. When the flag was taken down, everyone cheered and thought it was over. Those that comfortably traversed the entire building would not stop. They did not think their mission was over. That was the most perplexing part, how were they so comfortable staying there? Why did they not leave after the flag had been taken down? There was one more part of the show to be performed. Later I heard news of documents flying out from that balcony two floors below where the flag was once raised. They were meaningless documents with Arabic and Hebrew script. There were bills, contracts, invoices; all trifles. The news spread that the embassy had been breached. This created responses of what a catastrophe it was. The internet world and the media was filled with condemnation of the incident. Then came other sources which said the embassy had not been breached; but the damage had been done. The idea that the embassy had been stormed had spread, and even now, that is the term is being used. This was a controlled fire of the army’s making. Even the video shows the orchestration. Whether those scaling the building were army privates or used protesters I do not know, but it does not matter much anyway. There is sufficient proof, according to presidential candidate Ayman Noor that one of the instigators of attacks at the Ministry of Interior was a thug usually hired by the MOI themselves and who has burnt down the Al Ghad party premises before. The protesters fended off the attack against the MOI eventually probably counter to the MOI plan. I would imagine that some of the faces allowed inside the Israeli embassy building will include familiar thugs or perhaps soldiers. The violence erupted later when a police car ran protesters over, again. This was the real battle, and strangely enough, the police forces managed to fend it off. The idea was to create a scene where chaos prevails, and in time no one will remember what happened first, the violence or the so called breaching of the Israeli embassy. All this was combined with directed media to portray an event that did not take place. I would not be surprised if the Israeli government was well aware of this plan. Their response alludes to that much anyway. There was no storming of the embassy, there was a storming of Egypt by a group of militant mobsters who aim to keep its riches under their control. There is a plan to keep the people subdued and quell the revolution. Egypt did not breach any of its international agreements, and this protects the army. The papers seem prepared to be dispersed. Yes there was a desire to storm the embassy, and yes there was a desire to expel the ambassador, but there was never a way. The protesters that night couldn’t have taken on the arm but the army were peaceful and welcoming. All this was a play, and only the most ardent of fools in denial will see it as something else. There was no storm. Mubarakism is still alive. The Israeli Embassy: Under Friendly Fire? I will raise my suspicions for now without providing any analysis. I would have most definitely joined the ranks of those celebrating this victory had I thought it was real. I don’t care about the diplomatic ‘incident’, our borders have been breached and our soldiers have been killed. I don’t care about how uncivilized it may seem, our military and police are murderers, torturers and traitors to their people. This is a revolution and our rulers do not represent us. I will not condemn protesters for taking over Maspero, or even the parliament. A few hundred protesters started tearing down the wall protecting the Israeli embassy. Does it not rouse any suspicion that they were allowed to do so? The silence of the military in the face of this demolition is uncharacteristic of them. When I arrived in front of the Israeli embassy, all the walls had been demolished. Beneath us, scores upon scores of military and CSF personnel. A while later, a few ‘protesters’ were seen scaling the building. Only one of them managed to scale 5 floors on his own, the rest went into the building and came out every once in a while on another floor’s balcony. Finally, they were let in the building on the fifth floor. This was the Israeli embassy building, not the neighboring one. The really suspicious part is that they were in the building for more than 20 minutes before re-emerging again at various locations. Around ten or more were on the roof of the neighboring building and less than 10 were two floors below the Israeli embassy’s penthouse. What were they doing all this time before re-emerging? How come they had access to most apartments in the building? Who were they? With some difficulty the climbers returned to the yellow lit flat they’ve taken over below the embassy. Later, I heard news of paper being tossed out. More questions. Why were those papers being tossed out? Why wasn’t the embassy itself really stormed? Will we ever see those guys who stormed the embassy again? In one of the interviews, one of the stormers said that he delivered everything to the army, his command. This seems suspicious and raises another question. Why were the military personnel very peaceful with those protesters but violent with the others just next to the Saudi embassy? Were other protesters trying to storm the embassy building from the other direction? The most vicious fighting took place after the deed had been done. Could it be that after the desired had been done, the police decided not to risk escalations? Some foreigners have been targeted. Every time a foreigner is targeted, it spells the old State Security. Does it not seem very characteristic of the regime to blame protesters for what they themselves have been doing? Remember the prisoners that were let go? Remember the police stations that were burnt simultaneously? I have this strong suspicion that we did not storm the Israeli embassy. This was friendly fire. My suspicion is that this incident is the SCAF’s own Pearl Harbor or 9/11. My hope is that Egyptians don’t fall for it. Let's call it how it is. The regime has not changed. The idea that the revolution is successful is the biggest adversary to the reality that the revolution is ongoing. The reason I say this is not out of optimism, for that is a quality that I do not truly possess. I say it because we haven’t been beaten yet. As long as there is a will to fight in some of the people who made what we’ve achieved so far possible, then then the revolution is ongoing. I personally will not accept the status quo. I will not accept slavery. This is what the regime is all about. I do not accept it for myself, and I don’t accept it for others, even if they do. Those advocating slavery cannot free themselves, but rather, need to be set free. I am no savior, nobody is; but if enough people insist on their freedom, the others will be set free. I have been set free; set free of my illusions. I am no longer under the impression that a leader in a uniform can save us. I know fully well that salvation comes from within. I have been granted that which many others have not. I have had the opportunity to see other places, to have a good education and to understand intellectual freedom. Don’t ask me to give that up. I won’t anyway. I am a liberator. Not of everyone, but of myself. I feel liberated when I speak the truth. I feel liberated when I stand for justice. I feel liberated when my actions don’t fall short of the values I believe in. Today, the SCAF is implementing true Mubarakism at its finest. It’s all of the oppression and misinformation. Today, however, I have become immune to it. I no longer tolerate the injustice of an oppressive regime. I may not have the power to do much about it today, but when I’m given the opportunity I will not be a coward. I am not a brave person, nor have I ever been idealistic. But I was always capable of putting myself in another’s shoes. This is my blessing and my curse. I have imagined myself, beaten and broken. I have imagined myself unjustly locked up in military prison. I have imagined myself tortured and calling out for help. In my imagination, there has been no comfort but that of a voice calling out from outside the walls, ‘you are not forgotten’. That voice has been a comfort. I cannot help the torture or injustice, they cannot be altered instantly. I need only know that someone out there still remembers me; that I am not nobody. I am someone who exists and does not deserve this injustice. In my waking hours, I am that voice that calls out ‘you are not forgotten’. I don’t know who you are, and I don’t know why you’ve had to spend these rough torturous nights, but I am calling out. I know that they can’t hear me, but I’m calling out anyway. I am calling out because in their darkest hour, they must be imagining somebody out there who has not forgotten about them. I have long resented the SCAF for their pride and their arrogance. They think that they have the right to control millions of people just because of a bank account. Their military trials are as unjust as the emergency law. Their deeds are as dark as their predecessor. I feel liberated when I call them out on their evil deeds. I may be just a feeble voice calling out in the dark, but I call out because I need to, not because others need me to. I call out because it matters what a person thinks. I call out because I’m free. 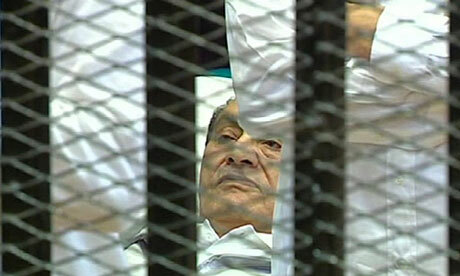 The Mubarak trial, while significant politically must be analyzed by an art critic rather than a political analyst. The spectacle viewed by millions deserves a better review with all the show that’s been put in place for the people. The true nature of the Mubarak trial is that of a stage play and must be evaluated on its theatrical rather than political merits. Let’s start with the writing. This play has been granted a large amount time for writing. The writing conditions may have been stressful; the protests in May could have attached a sense of urgency, and the 8 July sit-in may have expedited the execution. Yet, this script has been in the kitchen for quite some time so there can be no excuse for the quality of work produced. The results have not been catastrophic. The script may not be air tight, but was adequate for all intended purposes. The true challenge came with the execution which I dare say, fell below the mark. That’s not to say that some of the elements of the performance weren’t well executed. The set design, for example, was impeccable. The hall looked like a real court room and the cage within was built with great attention given to the tiniest details such as the spacing between the wires. The costume design was one of the elements to be marveled at. The white track suits were well designed and a perfect fit (at least in one of the episodes). Audio was clear and the picture contained much realism. Choreography was believable and not forced. Various actors danced their part. However, as any choreographer would tell you, the moves are only half of it, the other half is the dancers themselves. Unfortunately, the dancers were a true disaster. Besides a few other minor glitches, acting was the real failing in the whole production. Setting aside the fact that the accused was brought in on a stretcher instead of a wheel chair, the deposed president had too much vigor for someone rumored to be in and out of comas all the time. His strong voice gave way, as if he were reluctantly playing the part. He also fidgeted around in his bed too much for someone being brought in on a stretcher. His movements were numerous, impatient and showed signed of strength that should have been absent. He acted more like a healthy child confined to his bed by protective parents, aching to be released from the clutches of his bed and to go outside and play with his friends. The ex-president’s sons didn’t do a fine job either. Their faces were healthy and smug and their entire appearance was unconvincing. To make matters worse, Alaa, in a moment of improvisation, broke out of character and revealed his true identity by ordering a camera to stop filming with much authority. Supporting actors did not help either. The execution was not convincing enough. Characters forgot their roles and saluted the prisoners in a gesture that completely betrayed the authenticity of the entire play. On the one hand, one might defend them by claiming they are not professional actors, but on the other hand, it should not be much of an effort for them considering that this is their real job and the role should be executed with ease. That’s not to say the play was not an overall success, it was and it was viewed by tens of millions who at the very least appreciated the effort and thought put into this production. It is only that these little glitches that deter a viewer from fully being immersed in the drama and makes the whole story less believable. Here are a few things that would have made the production better. Had the SCAF not been a dictatorship meddling with the judiciary system, the likelihood of believing this was a real trial would have increased greatly. This is compounded with their reluctance to try Mubarak for a very long time and the constant rumors about his ailing health that was once one of the country’s taboos. Had Mubarak been brought in on a wheel chair rather than a stretcher and had he acted the part, the play would have been more believable. However the gravest of all flaws lies in the script itself which is devoid of any mystery. The way the case has been built, with evidence stacked very poorly against the deposed president gives away the ending. There has been no effort to stack the evidence in a believable manner to create any form of suspense as to how the play will end. The laws of the country have been set up by the perpetrators themselves to give them protection at any time. The SCAF’s refusal to alter any of these laws undermines the entire show. If there is no conviction, the play will extend as long as the crowd is willing to endure.